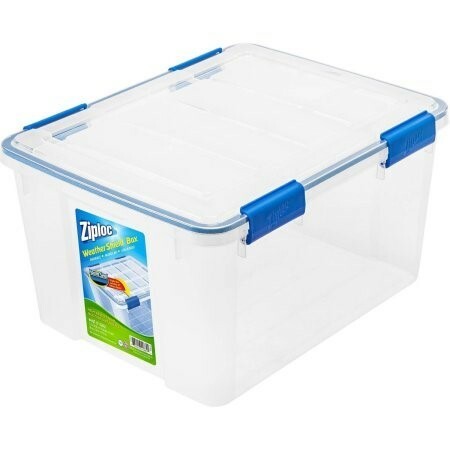 This is the 44 quart or small Ziploc Weather tight or Weather Shield Storage box with the gasket seal. These boxes make amazing storage. They are durable as most storage boxes or totes, but come with a gasket that makes them water tight, protecting further than most storage boxes. Not only does it protect against water, but pests, which is critical for long term storage. The 44 quart I would call a medium size storage box, excellent for files, and closet items one accesses more often. Bought these to storage some paper items in the shed. It is so moist here that I was storing anything with paper in the closet rather than in the shed even though I might only use it once a year. However the closet got too full. Last year I bought several containers to store Christmas decorations. When I unpacked the Christmas decorations in Dec there was no sign of moisture in the wrapping paper so the seal must work well. Christmas decorations did smell like plastic when I first took them out of the containers but smell went away. The grooves on the top of the lids are deep enough to keep the containers from wiggling when stacked. This container is very well made and sturdy. Water and weather tight with gaskets all around. I wish it was the size I needed. I need one that is just a little bit smaller and I can not find it. These tubs have a tight seal and are good quality; I've used three of them and just bought three more. This is a terrific piece of storage gear! The foam on the cover keep everything out and they stack on each other! Just awesome! Seems to be sturdy enough. I like the foam in the lid that gives it such a good seal. I have only had them for a couple of weeks but so far am very happy with them & plan to replace most of my totes with these. The containers are the right size. Not to large or when full not to heavy. I put antique patterns in them and it is working out perfect. I plan on getting more. I love these boxes. They are basically weather proof and stack very well. I use them for everything from crafts to storing camping gear and food when traveling. I have organized my closets and love that everything stacks neatly together and that you can see into the boxes. I love these containers. I use them to store my knitting and sewing supplies, and extra food in storage. They stack and close with rubber foam seal. I would recommend them to others.